Inflexible Bodies or Inflexible Brains? My clients often tell me that their bodies are so stiff that they can't do certain activities well. What is really stiff? What is really limiting your abilities? "Stiff" bodies? Or maybe "stiff" brains? Imagine that you believe that there is only one road to your home. You drive the same road everyday to go to some places. The road obviously gets used a lot as it's the only choice and starts to get worn out. At some point, the road requires new paving or fix. Once it's fixed, you start driving the same road. The road condition is improved, but wear and tear is a matter of time as it's the only road that you believe is available. In this situation, you're stuck with this road and you don't have alternatives. Imagine that now several new roads added. You now have several options. You're no longer stuck with the the same old road to your home. How does this story apply to bodies and brains? As we develop, we form habits. Habits allow us to do things automatically without thinking, which is a very good thing. Without habits, it'd take a very long time to do even very simple daily tasks such as brushing teeth or getting dressed. However, the fact habits "hide" from our consciousness eliminates different ways of acting (thinking, sensing, moving, and sensing). In other words, habits can limit ourselves to narrow range of possibilities. If there's only one road to your home, you won't have to think much to get home. It's efficient, but very limiting. When it comes to movement, we similarly create movement habits for the same reason. We tend to use the same pathway or movements repeatedly because of our movement habits. In a way, we (our brains) only see one road or a habitual movement path). What really limits our abilities is "stiff" brains. When our brains become "stiff", we limit ourselves/our abilities to only a small portion of our full potential or our habits, which in turn influences how we use our bodies so our bodies become "stiff". Fixing bodies/structures is like paving the old road so we can get back on the same road again (the same old habitual pathway). We still have only one choice. We're still limited to what we already know or habits. We can't truly overcome difficulties whether they are physical, intellectual, or psychological until we learn to make our brains more flexible, which would mean that we learn to expand our choices and act more freely without compulsion. 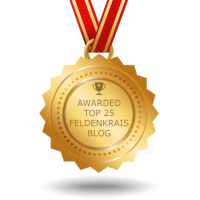 The Feldenkrais Method focuses on improving our awareness through movement to expand our options (thinking, sensing, moving, and feeling) and move beyond our habits, which means that our brains become more flexible. Are You Growing or Aging?